The main result of this paper is to exhibit a complexity model for discrete surfaces obtained by regular subdivisions of cells. 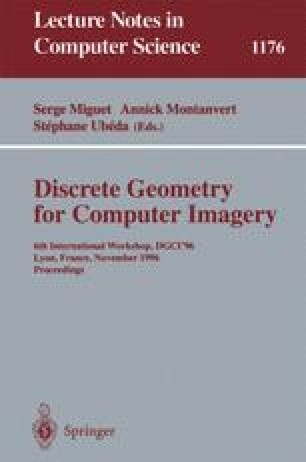 We use it for estimating the number of points that will be generated by the Dividing-Cubes algorithm to represent the surface of 3D medical objects. Under the assumption that surfaces have uniform orientations in the space, and can be locally compared to planes, we show that their average number of points is a quadratic function of the subdivision factors. We give analytical expressions for the coefficients of the quadratic form. Invited at the LIP of the ENS Lyon during spring 1996. This research has been done while the author was member of the LIP, ENS-Lyon.